Does the name banjo clock make any sense? A musical instrument and a timepiece have very little in common especially since a banjo clock does not chime the hour or contain any type of music box. To begin with, a banjo is meant to hang on the wall. It is this clock’s distinctive shape that somewhat resembles a banjo hung vertically, rounded end on the top and neck pointing to the floor, that gives the clock its name. This clock doesn’t really look completely like a banjo though. The dial is similar to the rounded end of the banjo and above the 12 o’clock position on the dial is a brass finial that traditionally takes the form of an acorn or an eagle. The middle of the banjo clock is much wider than the neck of a banjo and is always adorned with double rows of metalwork on each side. Where the rear tuning pegs of the banjo are located is replaced by a rectangular box for the pendulum with a hinged door for setting the pendulum. 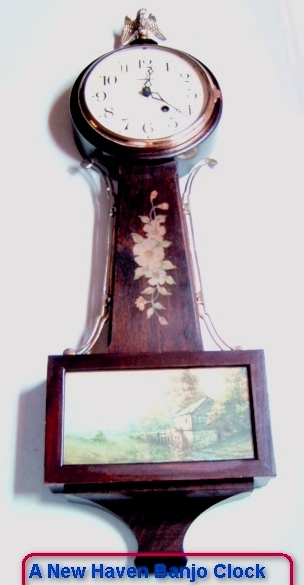 Both the middle of the clock and the pendulum box typically feature a painted scene that is reverse painted on glass. Below the scene is a large tapered decorative piece to complement the lines of the banjo clock. The lyre clock and the girandole clock both derived their shape from the banjo clock. The banjo wall clock is uniquely American in its design and origin and was invented by Simon Willard. Simon Willard was one of the earliest clockmakers in the colonies. Simon’s brother Benjamin was the first of the Willard brothers to make clocks, opening his shop in the pre-Revolutionary era of 1766 near Grafton, Massachusetts. Eventually younger brothers Ephraim and Aaron also became clockmakers. The original clock manufacturing building where the Willard brothers worked is now Willard House and Clock Museum in North Grafton and is regularly open to visitors. Sometime before 1800 Simon Willard moved to Roxbury, Massachusetts, today a suburb of Boston. It is interesting to note that Simon Willard himself never called his timepiece a banjo clock. Just like tallcase clocks became known as grandfather clocks in the late 1800’s due to the lyrics of a popular song, someone else coined the term and it stuck as well as the name grandfather clock. Instead Simon Willard named his invention “improved patent time piece” based upon a patent he received in 1802. Visitors can view an authentic Simon Willard “improved patent time piece” at the Willard House and Clock Museum. Authentic Simon Willard banjos are rare collector’s pieces as there were only 4,000 clocks made. Other Willard brothers made these clocks as well so it is important to distinguish a Willard banjo from a Simon Willard banjo. Simon Willard’s work on the development of the banjo has a colorful history and some famous connections. One point to remember is that most American clocks of the late 1700’s and early 1800’s were tallcase clocks or shelf clocks. Otherwise, the primary wall clock was known as a wag-on-the-wall which was a 30-hour weight-driven clock with a pendulum swinging in front of the dial. Simon Willard’s wall clocks were designed along the lines of the English wheel barometers and featured a spring-driven movement, a front pendulum and brass mechanism that ran for eight days. Simon Willard was encouraged by Thomas Jefferson to patent his design of the brass clock movement and Willard actually filed for his patent on November 25, 1801. The patent was granted on February 8, 1802 and signed by both Thomas Jefferson and James Madison. The new banjo wall clock became popular and other manufacturers began competing with Willard with his own design. Simon Willard received a second patent in 1819 for his “alarm timepiece” with an alarm mechanism housed in a cylindrical mahogany case covered with a glass dome. This unique clock is now known as a "lighthouse" clock due to its shape. In January of 2003 the United States Post Office recognized the contributions of Simon Willard by issuing a commemorative stamp that pictured the dial of a banjo clock. Simon Willard’s clock is uniquely an American clock that is considered to be a 19th century masterpiece. Many American clock companies made banjo clocks. They are still one of the most collectible of all the antique American clocks. eBay is one of the best and easiest ways to search for hard to find, or rare clocks to add to your collection. Buy a great banjo clock from eBay now. Click here.